Touhou-flavored hack-and-slash – now on Steam. Let’s just port everything to Steam! What? You think I’m kidding? I’m entirely serious – let’s just start bringing out every game on PC as well. I know it’ll never happen, but it’s a nice dream; imagine Bloodborne on Steam, for instance. While you enjoy that thought, I’m going to go ahead and start talking about the Steam port of Touhou: Scarlet Curiosity. We’ve talked about Scarlet Curiosity before – specifically, Chris did back in the far-off days of 2016. He called it “a unique and fun game to play that won’t make your wallet cry” and that’s about right. This is essentially a Touhou-flavored hack-and-slash with some minor loot elements and plenty of charm. You’ll play as Remilia or Sakuya and explore the land, searching for baddies causing problems in Gensokyo and then solving those problems by removing the baddies. You’ll collect gear, gain levels and learn skills as you go. It’s not the most complex or deep experience – your gear choices will largely consist of whatever has the highest numbers, for instance, and skill selection tends to boil down to whatever’s the most powerful option at the time. Still, if you’re interested in a more light title with familiar characters, you could certainly do worse; combat tends to have a somewhat floaty feel but it’s not bad, per se, and “floaty” might be preferable when it comes to dodging during the bullet hell-styled boss battles. Scarlet Curiosity wasn’t the most demanding title on the PS4 back in 2016 and, naturally, it’s not going to bring your PC to a grinding halt in 2018. If you’ve got decent specs, Scarlet Curiosity’s going to look and run just fine. Likewise, you’re not getting AAA-quality music or voice acting out of this one, but it’s good enough for what is essentially a doujin title. 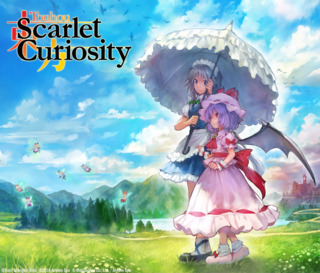 Chris’ point from a couple years back remains true here: if you’re after a decent enough adventure that’s not too pricey, you can certainly do worse than Touhou: Scarlet Curiosity. It’s a great fit for a Steam controller if you’ve got one of those, it’s not going to break your wallet and it’ll run on a toaster. Combine all that with some beloved Touhou characters and you’ve got a winner.